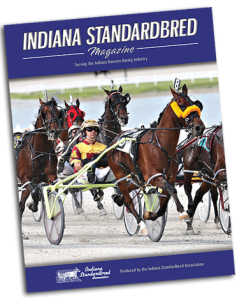 The Indiana Standardbred Association’s magazine is getting into full swing for the 2019 racing season. The first issue will arrive in homes in early March. All ads should be in next week to appear in the March issue of the ISA Magazine. Ad space is still available for the first issue of 2019 of the ISA Magazine. Contact Tammy Knox today to reserve your space. The ISA Magazine is now in its ninth year. The magazine is produced five times per year with the first issue featuring the annual ISA Banquet honoring the past year’s racing champions. The 2019 issue of the March issue will also feature new owners Shara Weaver and Micki Roach, new senior vice president and general manager of Hoosier Park Trent McIntosh, outgoing ISA President Jack Kieninger, all conditions and information about the upcoming late closers, sires stakes and county fair races as well as a look back at Hoosier Downs in the 1950’s. The March issue of the ISA Magazine is a great place to advertise for the upcoming breeding season. The state has acquired a few new stallions this season, and the magazine would love to place a spotlight on these individuals. For more information or to advertise in the March issue, contact Tammy Knox at tammyknox@ymail.com or call (618) 384-9323.